Lithograph on paper, watermark JW Zander, 27.5 x 15 cm (10.8 by 5.9 in). Signed by hand with pencil. Numbered 7 of 100. Unframed. Söhn HDO 360-7. Keßling 150. Significant and remarkable artist from the circle of the Berlin-Secession. Belongs to the so-called "verschollenen Generation" (Forgotten Generation), which describes a generation of young German artists born between 1890 and 1905. Artists who didn't have the possibility of continuous working and neither to exhibit consistently, because their lifes and creation was influenced by the difficult circumstances of two World Wars. 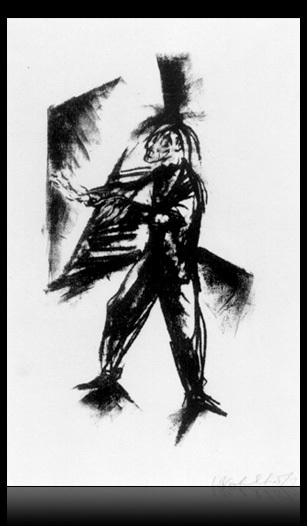 Mainly of the Nazi Regime, they became victims of the denunciation of '“Degenerate Art“. Their early work was often destroyed or torn apart and so they fall into oblivion. Until several newer publications and exhibitions, which reminded on their first successes, drawn a wide attention from museums and privat collectors to them. Recently many artists of this generation been revalued and continue to climb in value. They are also called „Expressive Realists“. Literature: Thieme-Becker, vol XXI, p. 208-209; R. Pfefferkorn "Wilhelm Kohlhoff," Berlin 1975; Weltkunst “Wilh. Kohlhoff - Ein Berliner Secessionist”, no 17/1989; Susanne Keßling" Wilhelm Kohlhoff, Schweinfurt 1993; Jeannette Schumacher, preparing Catalogue Raisonné. Further reading: Rainer Zimmermann, Expressiver Realismus - Malerei der verschollen Generation. Hirmer, München, 1994. Latest exhibition: Nächtlicher Tag - Wilhelm Kohlhoff (1893-1971). A traveling exhibition, started at Ephraim Palace Museum, Berlin from December 2005 to February 2006. With interesting exhibition catalogue, title as above. Fine lithograph from the year 1919 with expressive verve, illustrated in the artists Catalogue Raisonné. Excellent original condition.